Every year since 1993, the Goodwood Estate in Sussex has hosted the Festival of Speed, a motoring event celebrating the greatest automotive marques and vehicles. 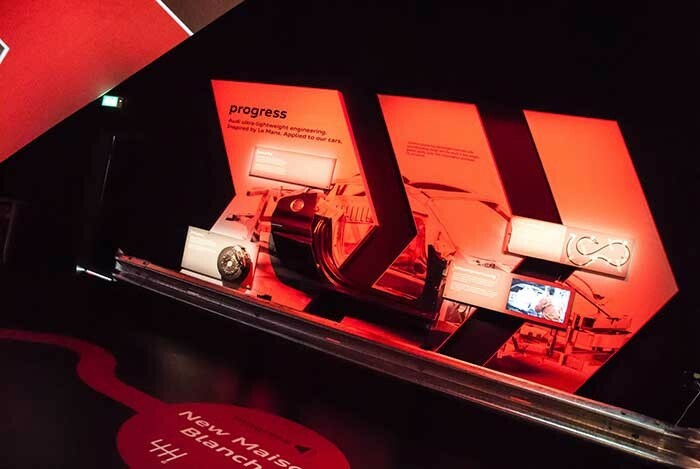 XL Events, working for client Shelton Fleming and their producer, Dan Rees, supplied an innovative interactive audio and video package for Audi UK’s brand activation at the 20th Anniversary Festival of Speed event. Audi’s stand, the largest at the show, was located in the manufacturers’ area and incorporated 1,700 square metres of external show space and a 400 square metre pavilion in which the experience was staged. Based on Audi’s victories at the 24 Hours of Le Mans 2012 and 2013, the experience presented a series of Audi innovations that were designed for high performance racing and now feature in road cars. Teaser and competition promotion videos were presented on four waterproof outdoor plasma screens from XL Events as visitors queued outside the pavilion. On entering, visitors encountered traditional red/green pit lane traffic lights triggered by the first of XL’s PIR (passive infra-red) sensors which allowed them to enter the main area to join Shelton Fleming’s recreation of Circuit de la Sarthe. Visitors followed the ‘track’ which featured five installations, each with ‘sound showers’ triggered by XL Events’ PIR sensors. The highly directional speakers, allowing the audio to be focused on each sensor area, were supplied by Dimension Audio, along with the audio routing. The content brought each of Audi’s event themes to life (performance, quattro, innovation and progress) and included a dramatic display of the 2012 Le Mans winning R18 e-tron quattro. One of the exhibits included an integrated XL Events supplied monitor that was programmed to run different content throughout each session. After a few minutes for visitors to explore the points of interest on the track, the main presentation began. 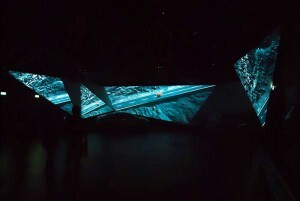 This featured a mapped projection onto six triangular screens, fed by seven of XL’s Panasonic PT-DZ 1200 projectors. Chief projectionist for the event was Alex Thomas, with Dan Mulcahy supporting. The six triangular screens displayed an array of fast-paced mixed footage which explained the development of Audi’s racing technology including the all wheel drive quattro and e-tron hybrid power systems used in Audi’s multiple Le Mans winning prototypes. The presentation then demonstrated how this advanced technology has transcended into Audi’s road cars. The motion sensors, sound showers, mapping, projections, internal and external monitors were all controlled by eight of XL Events’ Pandora’s Box advanced media servers, programmed and managed by Erica Frost.